Strictly Come Dancing returns to our TV screens tonight and the launch episode for the 13th series will pair up the celebrity contestants with their professional dancers. It will also feature a group dance from this year’s celebrity contestants, who are: celebrity chef Ainsley Harriott, Countryfile Anita Rani, boxer Anthony Ogogo, weather presenter Carol Kirkwood, singer Daniel O’Donnell, former Coronation Street actress Georgia May Foote, Call The Midwife star Helen George, champion athlete Iwan Thomas, singer/TV presenter Jamelia, The Wanted’s singer Jay McGuiness, Radio 2 presenter Jeremy Vine, TV and radio presenter Katie Derham, EastEnders star Kellie Bright, TV presenter Kirsty Gallacher and pop star Peter Andre. The professionals returning to Strictly will be Aliona Vilani, Aljaz Skorjanec, Anton Du Beke, Brendan Cole, Janette Manrara, Karen Clifton, Kevin Clifton, Kristina Rihanoff, Natalie Lowe, Ola Jordan, Pasha Kovalev and Tristan MacManus. The first show will also feature a final performance from last year’s reigning champions, X Factor presenter Caroline Flack and Pasha. Zoe Ball will also return to host It Takes Two on BBC2, providing backstage gossip and interviews with the Strictly stars. The BBC’s Strictly is set to overlap with ITV’s The X Factor every Saturday evening, leading to a ratings war between the broadcasters’ flagship programmes. Last year’s Strictly launch episode had viewing figures of 6.5 million, compared to 5.8 million for The X Factor on the same night. 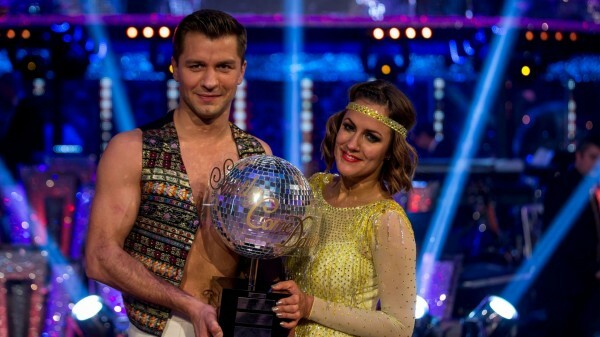 The Strictly final averaged at 10.6 million viewers, compared to The X Factor final’s 9.1 million. Strictly Come Dancing starts on BBC1, Saturday, September 5, 7.15pm.